We’ve been helping homes and businesses to find their perfect bar stool, for both the kitchen and the commercial bar for many years. You can find answers to questions we’re often asked below, to make your search a little easier. If you need any more information, or if you've got any questions, just contact our customer services team. What is the correct height for kitchen stools? The average kitchen worktop measures 90cm from the floor to the underside. We recommend that you leave a gap of about 20-25cm between the underside of your worktop and the seat pad of the stool, so you should go for a model with a seat height of around 65-70cm. You can find our range of kitchen stools here, or for more help choosing the right sized design for you, take a look at our Bar Stool Buying Guide. How can I work out the right width of stool for my bar? We’re often asked this, so we’ve created a handy Bar Stool Width Calculator to help you to work out the right width model for you. You’ll need to know three things: how long your bar is, how many seats you need, and whether your bar is freestanding or against a wall. The calculator will work out the best width of stool for your bar. What is the distance between a stool's seat and its footrest? Most stools have around 38-40cm between the seat and the footrest. However, this does differ between models depending on the density of the padding in the seat and how much this compresses when sat upon. Please contact customer services if you would like us to double check the exact measurement for you. Where can I see the dimensions of your bar stools? All of our product pages display the dimensions of the product. You can find a diagram within the product images, and there is an additional dimensions table below the images within the ‘Dimensions’ tab that you can find by simply scrolling down the page. What is a "commercial" bar stool? The main difference between a commercial and a domestic stool is height. A kitchen work surface is 90cm tall on average, but a commercial bar can be between 100 and 110cm tall. Commercial models therefore need to be much taller than domestic ones. They also tend to have heavier bases to make them stable, and are generally stronger than bar stools intended for home use. A range of which, can be found here. Do you have any stools that can be lowered for use at a dining table? We have a range of low stools with a seat height starting at 45cm. 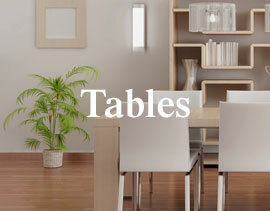 They have been designed specifically for use with lower height structures like the kitchen or dining table. Where else can bar stools be used? You don’t need to have a designated bar area to use a bar stool. They can be used in the workplace, at exhibitions, as a perch for carrying out hobbies and crafts, or even as extra seating for guests. Take a look at our article on Different Areas to Use Bar Stools for more information. Yes, most of our products can be purchased as single items, unless otherwise stated on the product’s individual listing page. If you’re ever unsure, you can give our customer care team a call, who will be happy to help you. Can I buy your bar stools in bulk? Absolutely, we welcome large orders. We have a warehousing of over 120,000 square ft., which means that we’re always ready to help our clients with larger bulk orders. For all enquiries and the best price please contact our customer services team, who will be happy to talk you through your options. A gas lift mechanism is a device often found in office chairs, which allows you to adjust the product’s seat height. Gas lifts are very simple to use. To raise the seat, simply pull the handle upwards to your desired height. To lower it, you just need to sit on it and lift the handle. You can find more information on this feature on our gas lift mechanism page. Will I need to refill my stool's gas cylinder? No, the cylinder is a totally sealed unit, so the gas doesn’t run out when you use the gas lift. Therefore it will not ever need to be refilled for the life of the stool. What leathers do you use in your bar stools? We use faux leather, bonded leather and real leather, and we also use faux suede. The type of leather will be specified on the product’s listing page. You can find out more about these materials in our Furniture Glossary. We can provide material samples for a range of our designs. If you would like a sample, just give our customer service team a call to find out if there is one available for your chosen product. Alternatively, you can visit our showroom to see materials and colours in person. Will a bar stool cause any damage to my floors? To help to look after your floors, our bar stools include protective floor plugs or pads on four-legged designs or a protective base on gas lift models. The design does vary- some feature a rubber floor guard, while others have floor protectors made of felt. You can find out the style of floor protector included with each product by looking at the individual features on our website. For more information, take a look at our article on protective bases. All of our stools have been designed and manufactured to be as stable as possible. We make our gas lift designs with the base and column heavy enough to keep it stable. Generally, a stool at kitchen height will not need to be fully extended. This means that its centre of gravity will not be too high, ensuring that it remains balanced. Our four-legged designs also offer great stability as the weight is distributed evenly across the legs, and our steel designs are often welded for added rigidity. How strong are your bar stools? In Britain, steel used in furniture production is required to have a minimum thickness of 1.2 microns. At Atlantic Shopping, we exceed these requirements, only using steel that is between 1.4 and 1.5 microns thick. This ensures that all of our steel products are strong and durable. In our wooden designs we only use solid wood or solid oak frames, and these are often reinforced with bracing bars, strengthening our four-legged models further. Read more about how we go the extra mile to make Strong Bar Stools here. Are your stools fire retardant? Yes, we’ve made sure that all of our stools are fire retardant. We make our padded models with fire retardant foam, and our faux leather is also fire retardant. You can read more about our compliancy with British fire safety regulations here. What is the difference between cheaper and more expensive models? We always strive to provide great products with excellent value for money. As a general rule, as the price increases, the weight, thickness and quality improve, increasing stability and durability. The upholstering and seat also improve, including the refinement of the stitching and level of support given by the foam padding. Do you have any matching bar stools and dining chairs? 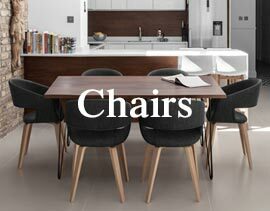 Yes, we do have a selection of matching dining chair and bar stool designs in both modern and traditional styles, and we also have a selection of office chairs to match our stools too. All of our matching designs can be found here. If a stool is "In Stock", how quickly will I receive it? All UK mainland orders purchased before 4pm will be delivered the next working day, free of charge. You can track your order on the day of delivery. You can find out more about our delivery service here. The stool that I want is out of stock, what can I do? If a stool is out of stock, there are two things that you can do. You can pre-order your stools and we’ll despatch them for next-day delivery as soon as they’re back in stock. Or, you can select ‘Email Me When In Stock’, and we’ll send you a reminder as soon as the product is available again. Yes, all of our prices include VAT and free next day delivery to mainland UK locations. Will I need to assemble my stools when they arrive? Most of our bar stools do require a very small amount of assembly, this is to protect the product when in transit. Take a look at our Bar Stool Assembly page, where you’ll find step-by-step instructions and a handy how-to video. If you have any problems, just contact our team. Will I need any tools to assemble my stools? The only tool that you’ll need is an Allen key, which is provided with your order. I ordered two items, why have I only received one box? The majority of our items are packaged two per box, so you might receive just one box if you have ordered two of the same product. If you do find that you have not received your complete order, please contact our customer service team. I can't raise my stool - what's wrong with it? If you find you’re unable to raise your stool, you should first check that the black cap protecting the hydraulic mechanism has been removed. You can find out how to do this on our Bar Stool Assembly page. If this doesn’t work, it may be that the hydraulic mechanism hasn’t been activated yet. To do this, simply sit on the stool and bounce up and down on it slightly. How do I level my wooden bar stool? If you find that you are having trouble leveling your wooden stool, this can often be solved by the way it is assembled or the surface it is assembled on. You can find further information to help with this in our article on How To Fix A Wobbly Bar Stool. How do I disassemble my bar stools? Our bar stools are really easy to disassemble. To find out how, visit our Bar Stool Disassembly page. Here you’ll find instructions and a helpful video demonstrating the process. Do you have a showroom where I can view your stools? Yes, we do have a showroom. Please feel free to pop in and take a look at our products. You can find us in Birmingham City Centre, near to Arena Birmingham. We have plenty of free customer car parking, and we’re open seven days a week. 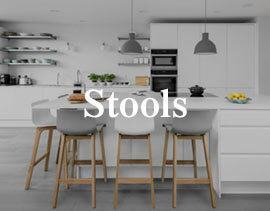 Our team will be more than happy to help find you the right stool. Click here for our contact details, address and details.